I’ve arrived in Darwin, Australia and have left Jill to her own devices in Cairns/the Great Barrier Reef. We will reunite in a few weeks in Sydney but not to worry I am visiting very dear and now very longtime (10 years) friends Jono & Jill Pytko. I must have impeccable timing because I last saw Jono & Jill for Christmas two years ago in Lithgow, Australia and it still rivals one of my best memories to date only to compete with their Scottish wedding in 2008. Jono and I met on a Contiki tour to Greece in 2003 and I can honestly say that trip has blessed me with some incredible friendships. I expect to see a few more friends from that trip in the coming weeks in Australia and of course there is my travel partner in crime Pam Manz, a former Chicagoan now Calgarian who puts up with my accidents and me every two years. Many folks work in aviation, real estate and in the mines (uranium, gold) but the entire Northern Territory is sparsely populated. The Australian Air Force is located here and provides a vast number of jobs. During World War II, Darwin was decimated by the same fleet that destroyed Pearl Harbor in the United States. The city served as the Pacific base for Australia and also the Americans. What could completely transform Darwin and is the talk of the town is the construction of a new pipeline. Most reason this will transform the area and finally put Darwin on the map. Prices are already ridiculously high. An average meal is $50 for one, a beer cost $9 and rent is $2800 for a two bedroom (and I contend somewhat in the middle of nowhere). I assume prices will continue to rise but I hope it means a higher quality of goods and merchandise will follow. Darwin is a beautiful city situated on the Timor Sea and Arafura Sea (Indian Ocean meets the Pacific Ocean) but for most of the year you cannot swim in the water. There are jellyfish in the wet season (now) and saltwater crocodiles year round. It seems a shame that in this very hot and humid climate that people must restrict swimming to pools or sea walled areas for safety. It’s hot here year round but the humidity increases during the wet season. The soil is a rich reddish orange color the vegetation is very green for the moment. It apparently gets quite dusty and the colors change to brown in the dry season (May to September). In the Northern Territory, there is a sizable indigenous population of Aboriginal Australian people. They live in surrounding areas designated by the government as well as nearby islands. It is believed the Aboriginal people migrated from Africa and Asia 70,000 years ago and made their way to Australia 50,000 years ago. While there is great diversity among the Aboriginal tribes, their language and customs are being endangered. There were more than 250-300 languages spoken and now all but a few exist. The Aboriginal population continually fluctuates as there were an estimated 1 million at the time of colonization and as few as 100,000 in the early 1900s. It’s challenging to count these groups in general and the last census puts their recovering numbers closer to 500,000. Similar to other countries with indigenous populations, Australia has struggled with the Aboriginal population since the Dutch and British first arrived. Today, Aboriginal populations are still segregated and closely monitored by the government. They can vote and many participate in politics but the vast majority I saw were wandering the streets – harmless but not a part of functioning society. After a day of city sightseeing, Jono and I went crocodile jumping (crocs don’t actually jump it’s really swimming but it’s a better visual). There are crocs everywhere in the Northern Territory and we visited a local river where there are thousands of saltwater crocs living and mating. 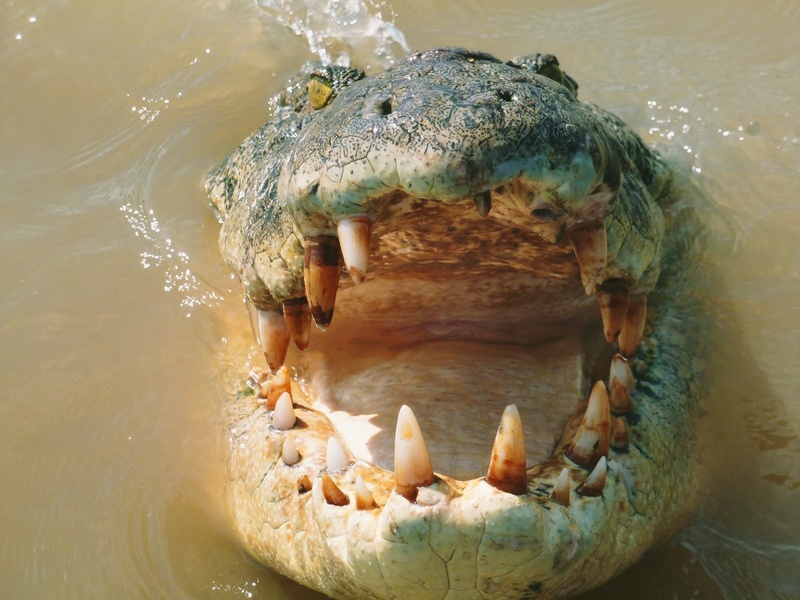 It was pretty amazing as we came about a foot from a crocs mouth (don’t worry we were in a boat) but we were so close we could see the inside of the mouth and sharp, biting teeth (see below). Apparently, crocs live until they are 100. The female crocs deliver about 40 babies from about 60 eggs and there are many more female crocs than males. The males are busy during this time of year impregnating several females. The saltwater crocodile is the largest of all living reptiles and will attack and kill humans. I learned very quickly that if I ever come face to face with a crocodile the smart thing to do is remain motionless. Crocs sense noise and will attack the revelers. I’m not sure if confronted with a croc that I could stand still or float quietly which is why seeing the inside of a crocs mouth provided me with the right incentive to stay away from any swimming in Australia. Saltwater crocodiles can be found in freshwater swamps and rivers in the wet season and the tidal mouth of large rivers or even the sea in dry season. Our guide told us that crocs fight for territory and that dominant males can occupy large stretches of rivers and streams. The males we enticed with slabs of beef were nothing I would want to encounter on a daily swim. Camping and outdoor activity is very popular in Darwin. As Jono and Jill indicated, there isn’t great shopping and not much to do so you either travel or stay active. 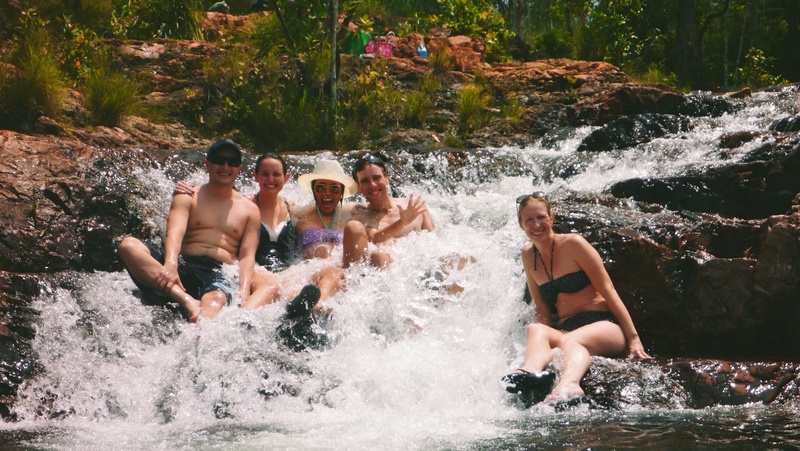 We loaded up the truck and headed about an hour and a half to Litchfield National Park where we finally cooled off in spring-fed falls and pools. We jumped off slippery rocks and swam in the Buley Rockhole, worked up an appetite and ate a lovely picnic lunch before the sky gave way to pounding ran. We swam in a quarry at Florence Falls where we exhausted ourselves swimming against the current to feel the beating water. It was the perfect way to combat the heat and see a different side of Darwin. The cascading rocks, rushing water and natural wildlife really provided great fun and a beautiful setting with new and old friends. I had a fabulous time catching up with Jono and Jill and meeting their friends Chae and Andy. Somehow the five of us spending the day frolicking in the sun gives me hope that our international friendships could give way to bigger and better things. Jono hails from Australia, his wife Jill from Glasgow, Scotland, Chae from Japan, Andy from Edingburgh, Scotland and me from the USA. It’s what I appreciate most about travel. Meeting new people hearing their stories and incorporating their visions and ideas into my daily life. The time always goes by fast but I know I will see everyone again if not tomorrow soon enough. Off to meet Patrick (yes my brother) in Sydney and celebrate another fantastic Aussie Christmas.